Good morning and welcome! To kick off my new series of author interviews, the wonderful Jessie Clever is joining me today for a cup of tea and a nice long chat. She even has an audio book to give away to one randomly chosen visitor! If you would like to win a copy of Inevitably a Duchess on audio (and who wouldn't? ), leave a comment below with a way we can contact you if you win. Without further delay, Jessie Clever! Chocolate tea! I know, they actually combined two of my favorite things, and my head nearly exploded. I even asked Santa for some this past Christmas, and he was gracious enough to leave a whole tin in my stocking! You are an independent romance author. What made you decide to go independent? I had been working with an editor from one of the Big 5 and she had told me she loved my writing, my characters, my voice, everything, except she couldn’t “sell” my stories. She asked me to write a contemporary novel, which I did, and when I sent it to her, she had been moved to another division and couldn’t buy it. At that point, I realized my writing career had been taken over by sheer luck, and I didn’t like the odds. I decided to take back my writing career, and that year I published my first book. What do you like about being an independent author? Are there setbacks? I like having the control. After my experience with the Big 5 editor, I have a stark fear of letting go of my writing career. There are always setbacks when you are self-publishing as the market gets flooded with more and more content that is not given the time or attention that other independent authors dedicate to their work. But now is a beautiful time to be a writer, and I would never discourage anyone from jumping in! What was the duck’s name? Why do you set your romantic suspense in the Regency period? I accidentally became a history major in my undergraduate life when I studied abroad in Glasgow, Scotland. School is much harder across the pond, and I ended up doing all this research using primary resources for my history classes. When I finished I had an unusual amount of knowledge of the Regency period, particularly the Napoleonic Wars. My dad, always the pragmatic one, asked what I was going to do with this knowledge, and so I found something to do with it. What is it about historical fiction that you enjoy? I like how fluid history is. I know this sounds weird, but history is written by the winners. There are such conflicting accounts of what actually happened, and scholars are continuously finding evidence of different theories. I find it fascinating that what should be fact can be so malleable. I took this idea and ran with it when crafting my Spy Series. I love spies in fiction. What made you decide to write a series about spies? The spies happened by accident! As most great things do in my life, I should add. I was writing the opening scenes of my first book, Son of a Duke, and I knew a character had to come in with government authority to take care of a problem with a dead body. I didn’t want him to be a Bow Street runner, as I had already read enough romance novels with runners in them, so I said, why not a spy? I suppose the trouble in researching spies is that the best ones won’t have anything written about them! How do you research your books? I was recently asked this question, and again, I say the spies happened by accident. When I sat down to write about the Blacks, I was actually more focused on the social upheavals that occurred around the French Revolution and into the 19th century. That was actually meant to be the focus on this series and the reason why my characters come from such different social classes and even countries. However, in doing this research on social history, I read accounts of British citizens being smuggled out of France during the revolution, but the accounts never said who did the smuggling. So I said, what if they were spies? When I needed that government authority in Son of a Duke, spies were already lingering there in my mind. Reading about history really is a dangerous sport! If you had a time machine and could go back in time and meet anyone or do anything you wanted to without any adverse effects, what would you do? Two things instantly spring to mind. The first is I would love to have a conversation with the two famous Hepburn actresses of the classics around the year 1990. I read a lot of biographies and am fascinated with old movies, and the two women I find the most fascinating are Katharine Hepburn and Audrey Hepburn. The reason for the year 1990 is I would want to know what they had learned through their life, what lessons were important, and what advice they would give a young woman like me. The two actresses came from very different places, but each struggled with their own obstacles. In reading Katharine’s autobiography, she imparts a lot of wisdom. I can only imagine what the two of them would have to say. The second thing that popped into my head is I would like to go back and talk to my dad. He passed away recently, and as it happens with these things, you learn so much more about people after they are gone. I have so many questions for him, and so many times I go to pick up the phone before I realize he’s not there. I’d like to go back to visit with his younger self and ask him all of these questions. I see so much of myself reflected in the life he led, and I just want to know what he was thinking while it all happened. He was a schoolteacher, a farmer, an outboard motor mechanic, a storeowner, and a U.S. Coast Guard inspector. He belonged to the Masons and built several of his own houses. He made wine and painted unbelievable renderings of his time spent working at the Bethlehem Steel Mills in Buffalo, NY. He was a true Renaissance man, but I didn’t know just how much of one he was until after he was gone. Are there other genres or time periods you’d like to try? I have just started research on my next two projects that center on 1830s London and 1880s and 1920s New York City. There is also a bit of the paranormal in the New York City project that is rather tricky to research, but I’ll do my best! Tell me about the Franconia Notch Trilogy. The Franconia Notch Trilogy started with the book I wrote for the Big 5 editor, and I said, this deserves to come to light! In writing it, I found the main character had these awesome friends, and it blossomed into a trilogy. I will admit here that these books contain a lot of autobiographical moments, and I’ve enjoyed putting some of the funny things that happen to me into these stories. In particular, in When She Knows when Shannon sees a spider in the bathroom and she makes Ian watch for the spider while she pees, I’m proud to say I made my husband do that. The spider did not get me, and I never saw it again. But I wasn’t going to risk it! Your covers are gorgeous. How do you put them together? Do you design them or do you have artists you work with? Thank you! I design my covers myself, so that means a lot to me! I try to use the covers to focus in on the relationships between the main characters and what really drives that relationship. I look for images that then suggest this theme. For Inevitably a Duchess, Jane’s character regains control of her life after a horrific marriage. I wanted her character to be seen as strong on the cover, so I chose an image where the female model had her hand on her hip to suggest this quiet strength. I also have a knack for design, fueled by watching too much HGTV. Who are your favorite authors and biggest influences? I have to give a shout out to Julia Quinn here. A million years ago I sent JQ an email asking her what was the best way to become a published author, and she actually responded! She told me to join RWA, which was the best piece of advice I could have ever gotten. So thank you, JQ! I also owe quite a bit to Patricia Cornwell, whose Scarpetta books are a go to when I simply need a good book to read. It’s from her that I developed the need for mystery and suspense in my novels. And for sheer pleasure, Hannah Meredith and Brenda B. Taylor, two great independent historical writers. Do you have any funny writing habits or rituals? I talk nearly continuously to my writing partners. This would not be unusual except my writing partners are Basset hounds. I ask them questions when I get stuck, and I interpret their facial expressions for answers. It doesn’t help that they nap…a lot! What’s next for Jessie Clever? Richard Black, the Duke of Lofton, waited for her, watching as the agony of marriage broke the woman he loved. Lady Jane Haven had to find a reason to survive, a purpose to carry on when it seemed God would not just let her die. But when fate finally offers them a chance to be together, a treasonous plot threatens to keep them apart. And when it becomes more than just a matter of survival, Jane must find the strength to be his duchess. 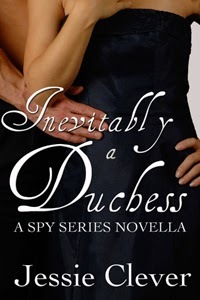 Don't forget to comment for a chance to win an audio book of Inevitably a Duchess! Great interview Jessie. I love the Regency and spies so you've got me already. I live in Australia so you don't have to tell me about spiders. Ick! 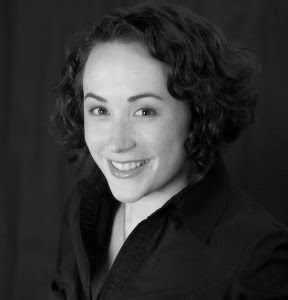 Your story about Julia Quinn reminded me of my story with Stephanie Laurens - love it. Good luck with your new book. Thank you, Cassandra! I've heard horror stories about spiders in Australia. You're a brave girl!